Daily use of Kungfu English will take a Chinese learner of English from a zero base to effective communication in just six months. It’s cool, convenient, fast, effective and enjoyable to use. Specifically designed for mobile devices, it eliminates traditional problems of missed classes and scheduling conflicts. And the usage tracking features make it a dream come true for HR Managers worried about their ROI. Users benefit from the very latest in modern brain science and learning psychology. Combined with cutting-edge multimedia content, learners immerse themselves in an English learning oasis any time they like. 3,000 words make up 98% of spoken English. Kungfu English teaches rapid mastery of these every day words. English is put simply. Key words and phrases are repeated in many ways for use in all possible situations. Language is taught via phrases, not individual words. Phrases add context to the words and support rapid understanding. 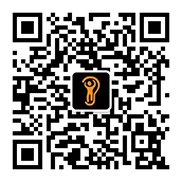 It contains the world’s first multimedia pronunciation guide designed for a mobile device. Video clips of a native English speaker teach accurate pronunciation, putting a 24*7 mobile English coach in every learner’s pocket. Learning is 50% better with music. Spoken word audio is accompanied by rhythm and music. This increases memory formation by up to 50% and maintains higher levels of interest and motivation. It’s about real communication, not classroom English. The Kungfu English course reads just like your favorite English novel, not a boring textbook full of contrived dialogues. Learners pick up more than just English. Graduates finish with the key skills required to master any foreign language. Global MNC Executive Coach and Linguistics Expert Chris Lonsdale uses Mandarin Chinese to share critical insights and techniques for success in more than 50 short video clips that appear throughout the course. Continuously featuring a human element in the technology builds rapport with learners and motivates them to complete the course in full. The international design team harmonized the very best of Eastern and Western approaches in addition to Chris’ own knowledge garnered through more than 30 years of fieldwork. The real-life experience of the design team members has already proven The Third Ear learning principles to be a most effective approach for accelerated learning. Learners make faster progress and waste less time pondering what to do next when they follow the pre-designed Study Paths. At the same time, the option to “Free Play” the media in any order they chose is retained. For each lesson there is a list of media and a required play count. Learners receive constant updates on their progress as the play count decreases and becomes a red “tick” to signal completion. The FaceFonics© Program teaches correct English pronunciation and spelling rules. There are 109 episodes in total, covering all the important sounds as well as key variations (e.g. 2 and 3 syllable words). Each episode contains three videos. In the first video, there are no subtitles – just the video of the Voice of America (VOA) Radio Presenter and pictures of words being expressed. 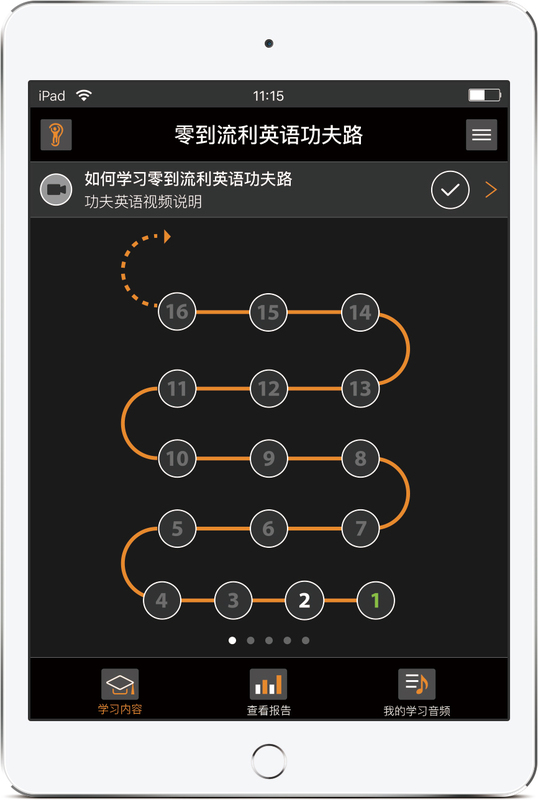 The second and third videos contain English and Chinese subtitles for faster acquisition of the meaning and spelling rules. Both the English and Chinese words appear on the screen in time with the music. The songs also include an option for the learner to hear something again if they missed it. They simply click on the “Back 10s” button to jump back and clarify anything they weren’t clear on the first time. The Audio Content is repeated throughout the course. This spaced repetition approach has long been proven to increase long-term memory recall. 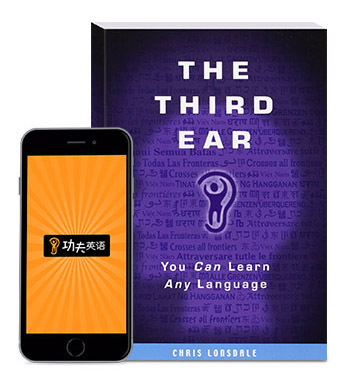 Learners are challenged to read, hear and understand The Third Ear book, with necessary support tools provided. They learn how to access meaning directly in English, rather than through a time-consuming process of translation. This process of going directly from English to understanding is fundamental to mastery of the language. The book is presented on the iPod touch (or iPhone) both as text and spoken-word audio. Learners master English rhythm, stress and pause patterns by listening to the audio book alone. 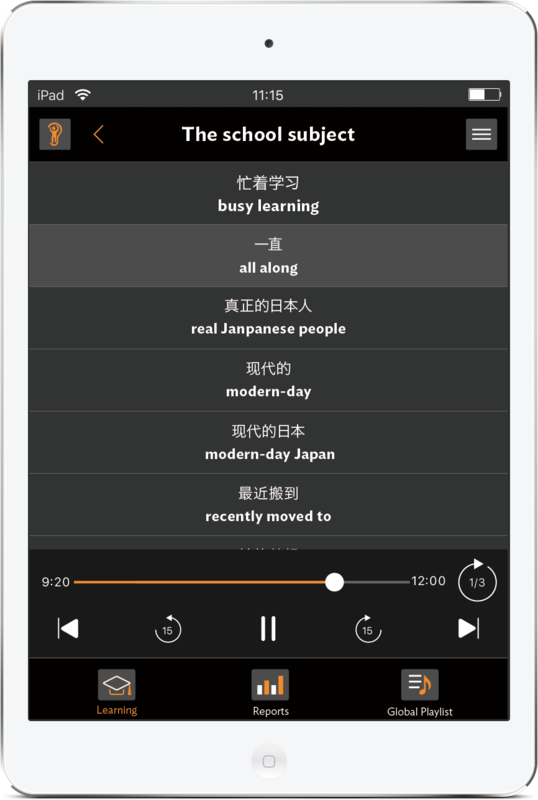 And the option to simultaneously hear the audio while reading the e-book enhances pronunciation and spelling skills. Download additional support materials (lyrics, text files etc). Test their progress and receive instant feedback with online quizzes. Challenge themselves to go further in the "More Practice" section. Receive answers within 48 hours for any technical or learning-related questions. Before starting the program, each learner enjoys a professional consultation delivered by a trained expert. Based on their individual requirements, learners receive a personally crafted study plan in order to realize their learning goals in the shortest time possible. At the same time, learners receive support and guidance on use of the online testing platform. Learners can enjoy regular 1-1 instruction with a qualified bi-lingual Chinese or Native English coach. Topics for discussion are taken from the Kungfu English course or personal requests from the learner. 1-1 sessions ensure learners solidify their memory of new vocabulary and increase their confidence when speaking with foreigners. Business customers enjoy a level of reporting and accountability never before seen with mobile learning. All activity – encompassing time spent, lessons completed and test scores – is recorded and reported. You get a better ROI because the mobile approach increases opportunities for use and the reporting sends a clear message that learner activity is being measured precisely. Best of all, the reporting is tailor-made according to your internal benchmarks. Our professional customer service team supports the reporting with direct follow-up of individual learners. Your staff do value-added work that grows your business while we take care of the routine. Kungfu English customers enjoy live editing of English correspondence materials (emails, letters faxes etc). Our professional editors can save your employees thousands of hours of lost productivity and your managers can spend time growing your business instead of spell-checking the work of their direct reports. Best of all, we deliver same working day turn around on important communications. Contact us now to learn more about how your organization can reap massive gains from improving your employee's English communication skills.